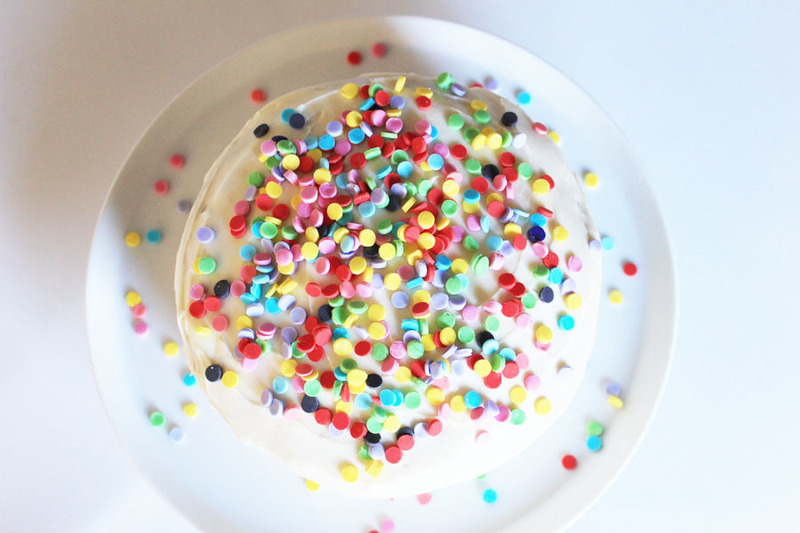 Edible confetti. What’s not to love. After I had the idea I googled it and it turns out you can actually buy this stuff. Hence the “homemade” in the title of this post. 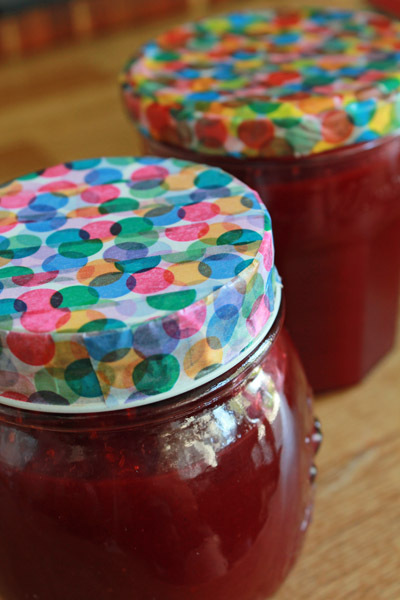 But making it yourself means you can control the colours and the additives. And spend time when you should otherwise be doing mundane housework enjoying the meditative qualities of kneading fondant icing and flexing your punching muscles. Fondant icing (I use Orchard brand, available in large supermarkets here). Gel food colouring (I use Americolour and Wiltons brands). Cake cooling rack (good but not essential). 1. 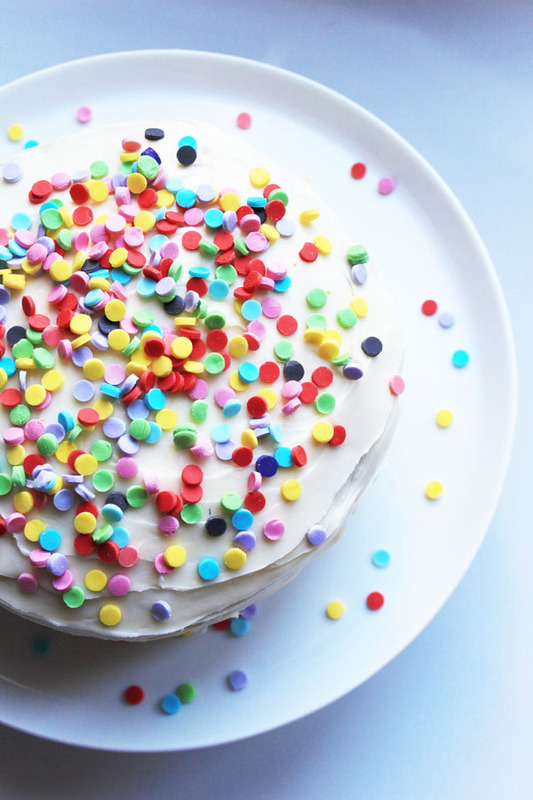 Start by sifting some icing sugar through your sieve onto a corner of your workspace. Make a little pile of it. You’ll use this to dry the fondant out a bit as you knead it. 2. 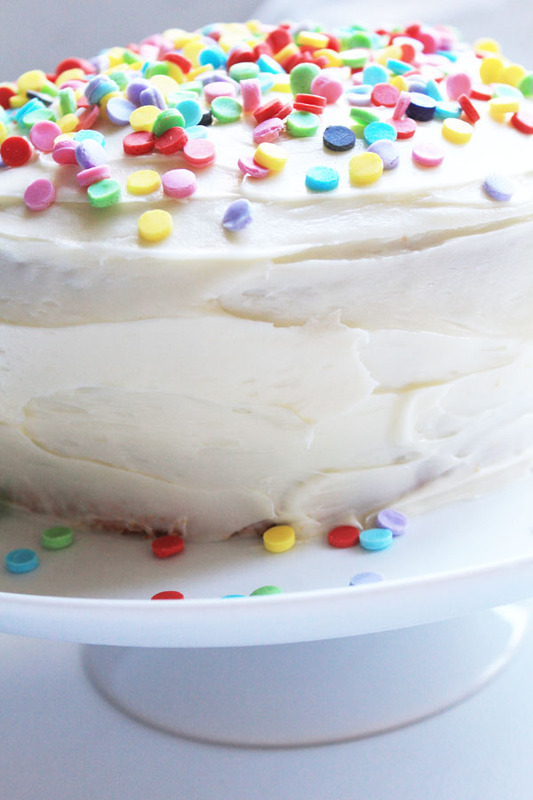 Tear off a golf-ball sized piece of fondant and knead until smooth and pliable. If it is too sticky, add some sieved icing sugar. 3. Add a drop or two of food colouring. These gel colours are very intense and you only need a little. Better to add a little and more as needed. 4. 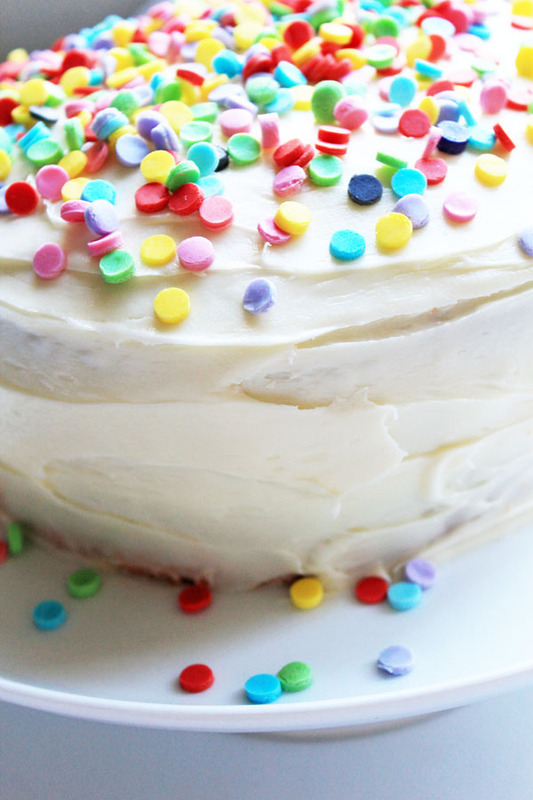 Knead the colour through the icing until it is even, adding icing sugar as you go to keep it soft but not sticky. It tolerates quite a lot of icing sugar being added without compromising the texture or colour so don’t be afraid to add a fair bit if required. 5. 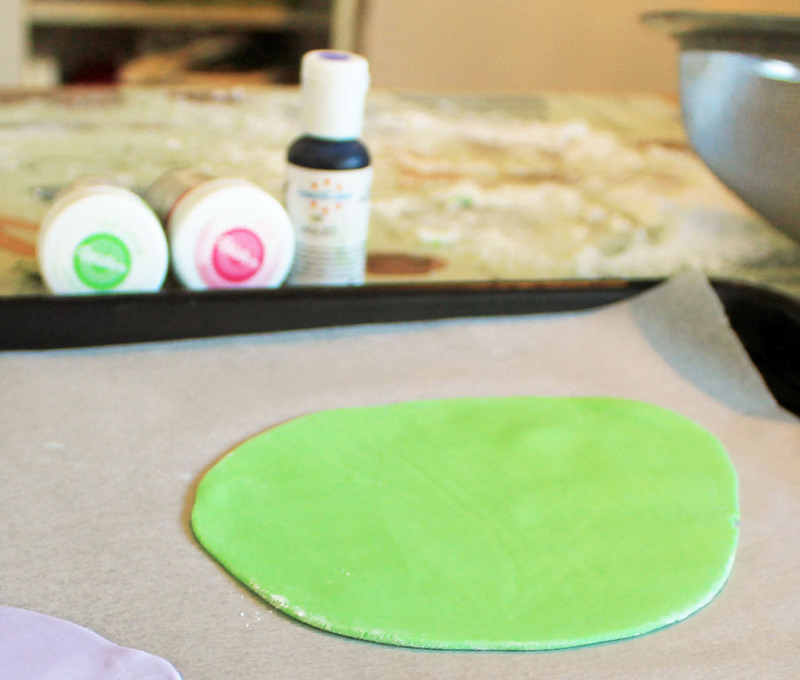 Roll out your ball of fondant as thinly as you can between two sheets of baking paper. 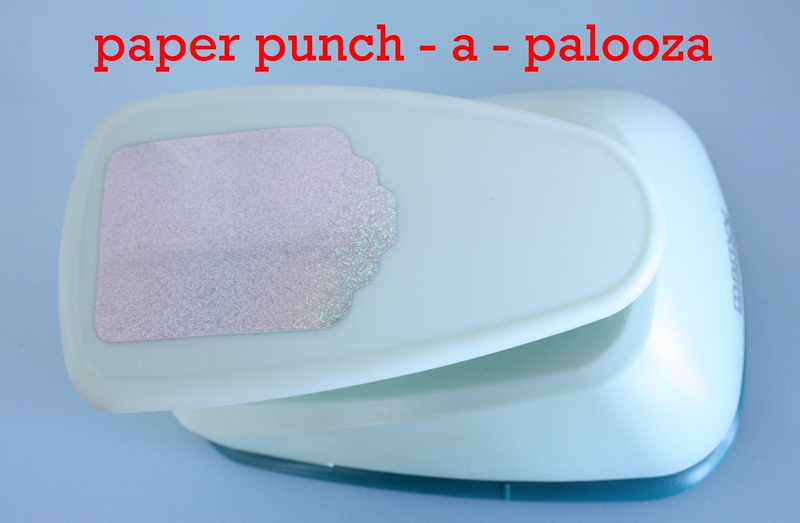 It doesn’t have to be paper-thin – just thin enough to get into the paper punch. 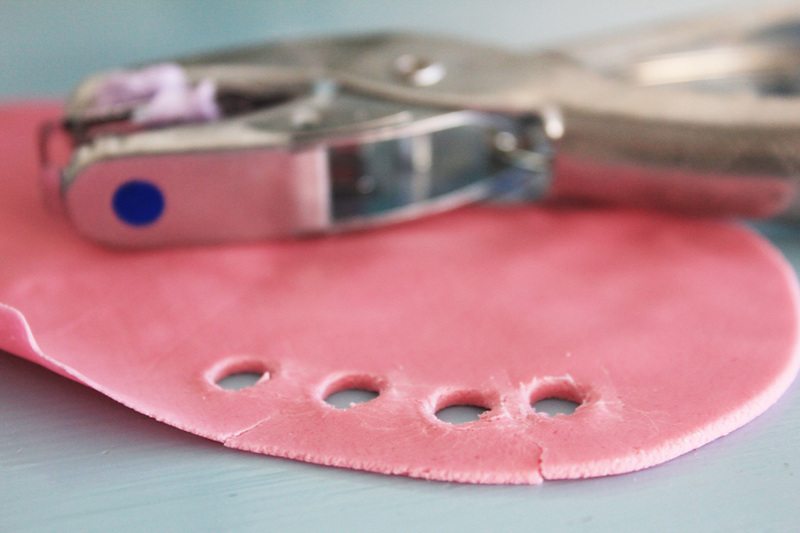 Peel your flattened fondant off the paper and place on another piece of baking paper on a tray to dry for a few hours. 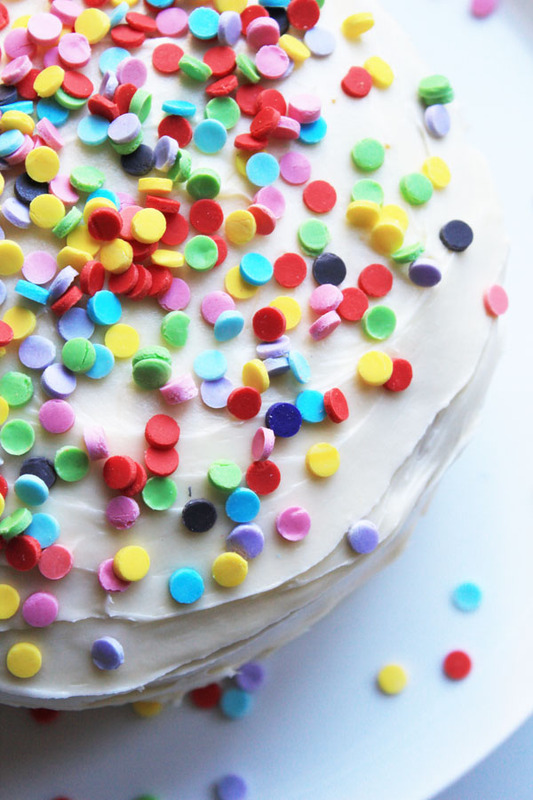 When it is dry and you can lift the whole thing off the paper without it drooping too much, transfer it to a cake cooling rack if you have one to let the air get to all sides of it. If not, just leave it on the tray and allow to dry for 24 hours. 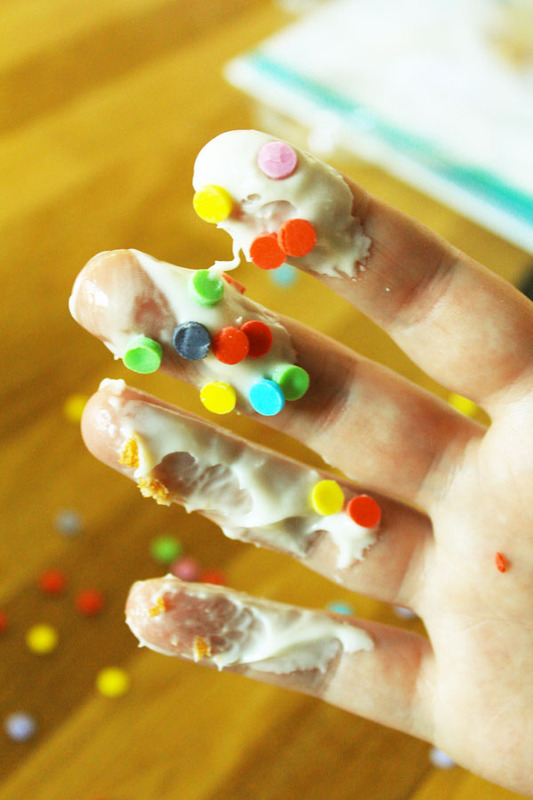 Once the icing is stiff enough, get punching. I am loving how this looks. Quite “spectacleear”, as my 4 year old would say. And there you were thinking your paper punches were limited to use with paper, washi tape, masking tape, soap and fabric. Oh, you! It’s been babypalooza around here. No, I have not been delivered of any more of my own (“delivered of” – love that phrase, used most recently by Buck Palace to announce bonny Prince George’s arrival), but friends and family are popping them out all over the place. Most recently, my darling brother-in-law and his bewdiful wife had a baby girl. To celebrate I made her this little top using the free sewing technique I’ve talked about before when I made these napkins, and these personalised paper gift bags. Now as you can see, this is not a neat and perfect art. By its very definition free motion sewing gives a sketchy, scribbly look which I adore but won’t be everyone’s cup of tea. But if it is, then that is awesome on a stick and here’s a little how-to. 1. 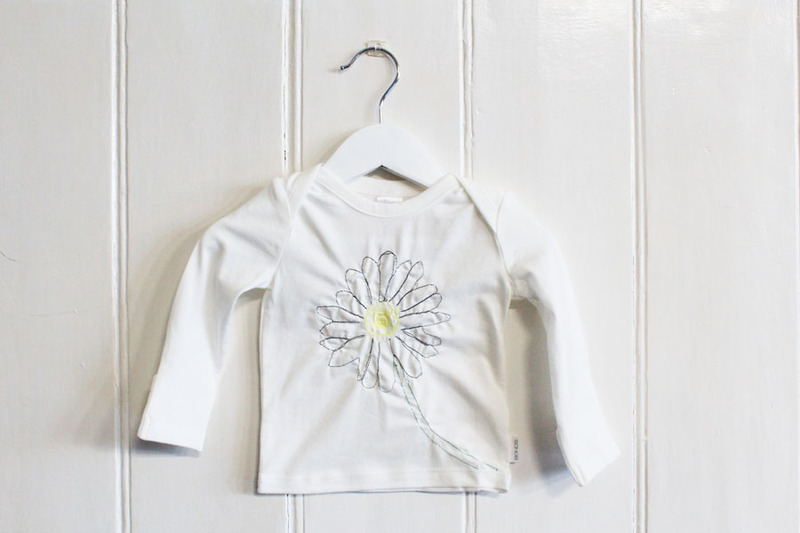 Print your design onto paper and trim it down so you can slip it under your garment. 2. Trace the design using your eraser pen. 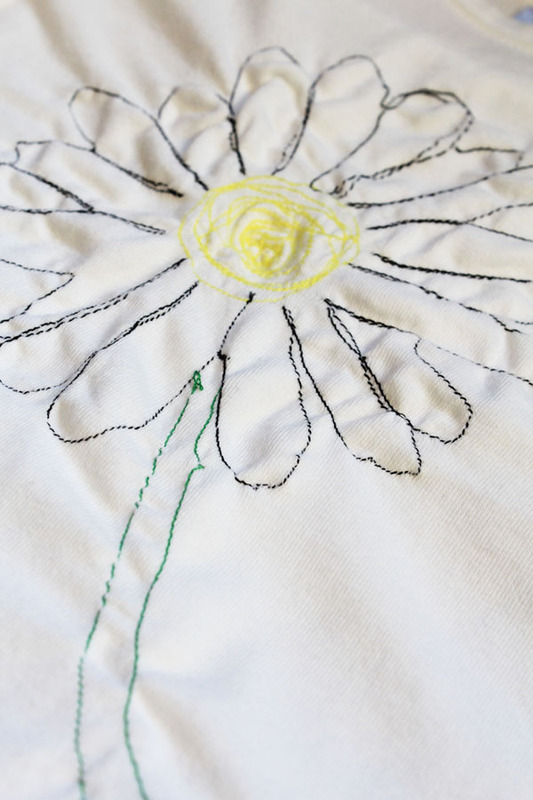 If the fabric is too thick to see the pattern underneath, you may wish to use another method for transferring your design like a transfer pencil and hot iron. However be aware that not all transfer pencils wash out so make sure you use one that does. 3. 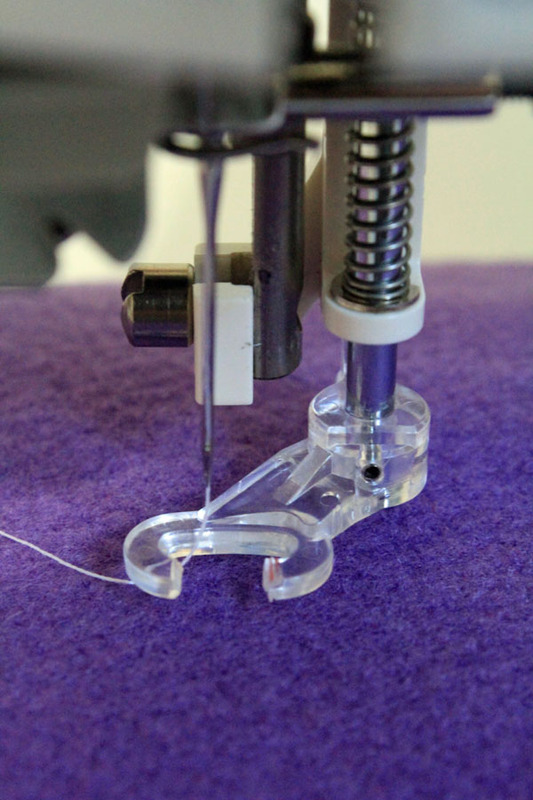 Fit your free motion sewing foot to your sewing machine. I have a standard Brother foot that I modified using this really excellent tutorial. You don’t have to modify your foot – just makes life a bit easier. I’m all for easier. 4. Sew over your design. 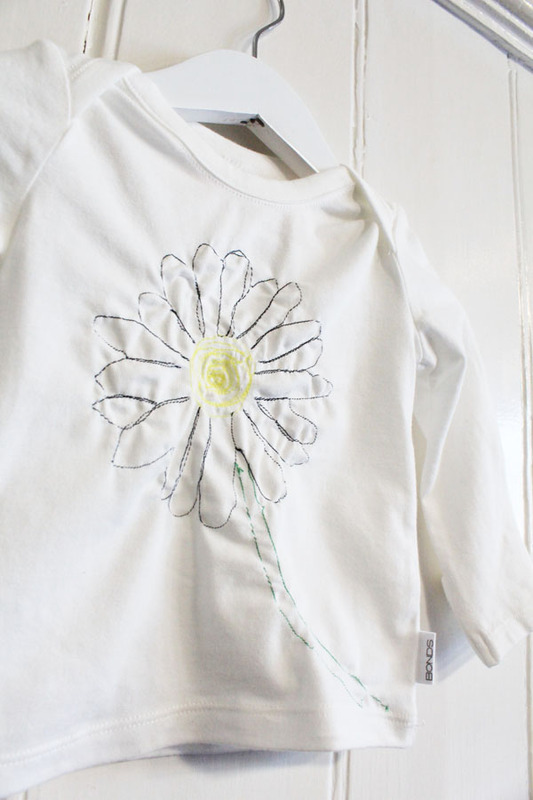 Free motion sewing can take a little bit of getting used too so you might want to practise on some scraps first. Here are some good tips and here’s a video of a guy doing a free motion sewing portrait. It’s amazing but his fingers seem to go so very close to the needle it makes me shudder. No blood on the fabric – that’s my rule. 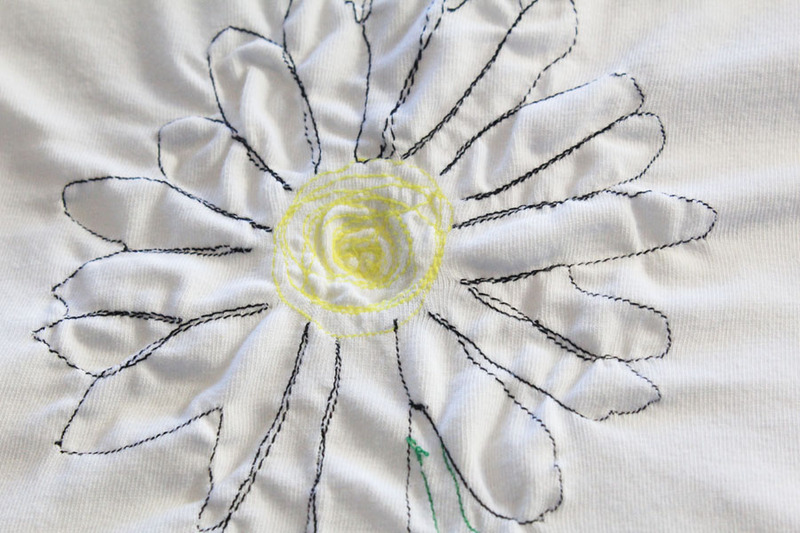 You’ll notice how the fabric has puckered – especially around the flowers. That’s what happens with stretchy material and, again, I like it because it gives texture. However, if you want a flatter result, simply iron some tear-out or wash-out stabiliser behind your design before you begin. So can you guess my niece’s name? And no, smart arse, it’s not Roughly-Sketched Indeterminate Flower. And I’m worried you might think they called her Carnation. It’s a daisy, people. And so is she. PS: Alex and Jo own and run the fabulous and beautiful St Isidore on the NSW South Coast. The restaurant is in both the 2013 Gourmet Traveller’s Restaurant Guide and the Sydney Morning Herald Good Food Guide. Do go and give it a go if you’re in that part of the world and tell ’em I sent you. It’s a cracker. 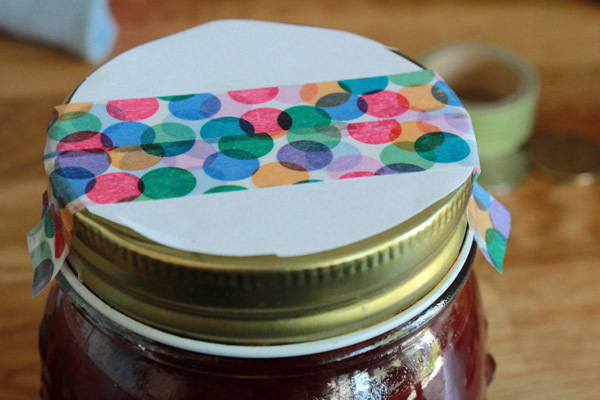 Ahhhh washi tape: is there anything thou canst not improve? I have been bottling up a storm lately. Well, when I say lately, I pretty much just mean today. I bought 17kg of tomatoes at the farmers’ market this morning and at this point have 4kgs worth bottled and sitting on my shelf contemplating a saucy life. But more on my direct transition from my thirties to nonna-hood in a later post. 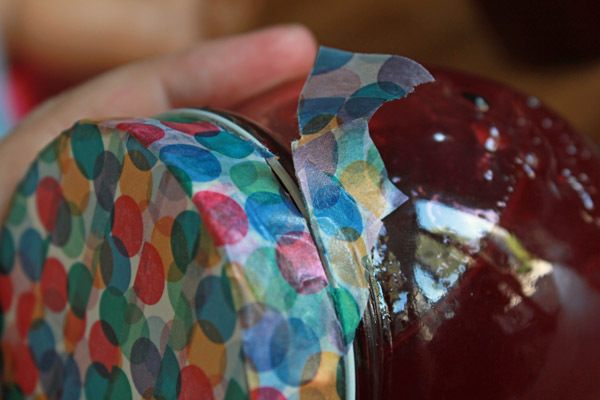 For now, I wanted to share another way you can use washi tape; to prettify the lids of your homemade bottled stuff. 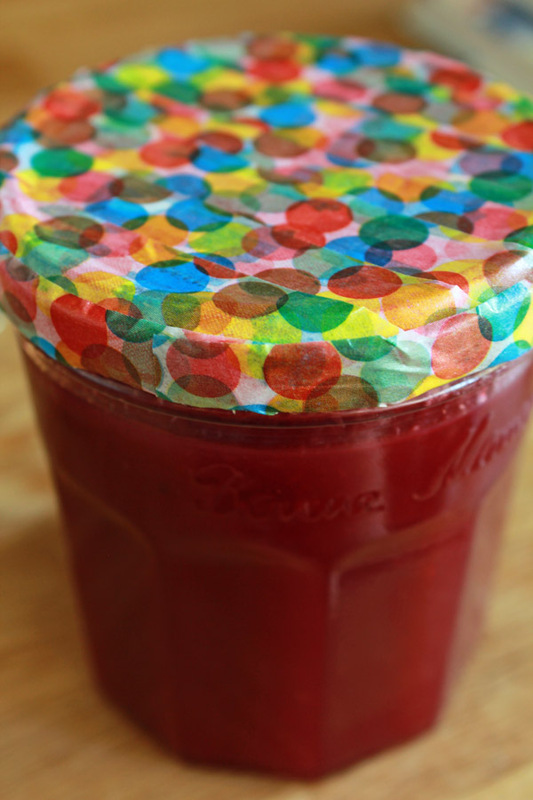 I LOVE giving away bottles of stuff I’ve made but I’m always slightly irked by the crappy lids on my oft-recycled jars and bottles. Baking paper and baker’s twine are nice but they are outta there once the bottle is opened for the first time. 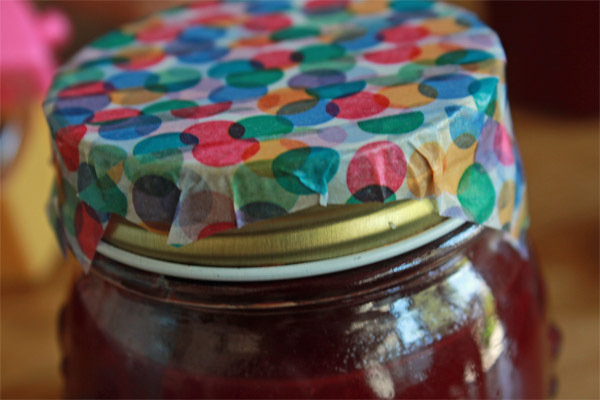 Decorate your tops with washi tape and the lids will stay as perty as your preserves within. 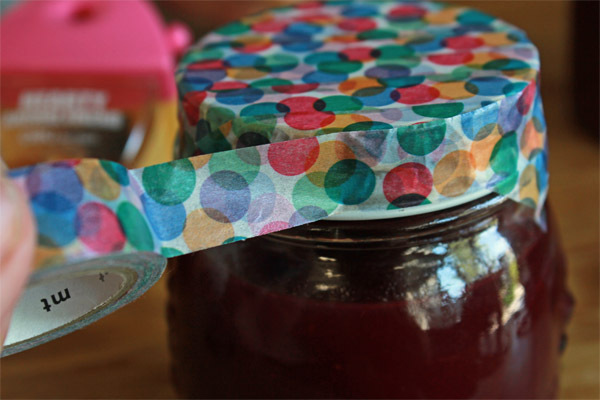 If your lids are a dark colour or heavily patterned, pop a small disc of white paper on top before you start to washi (yes, it’s a verb now too) so your tape is light and bright. Trim overhanging bits with an exacto knife or that surgical scalpel you’ve had lying about in the top drawer. 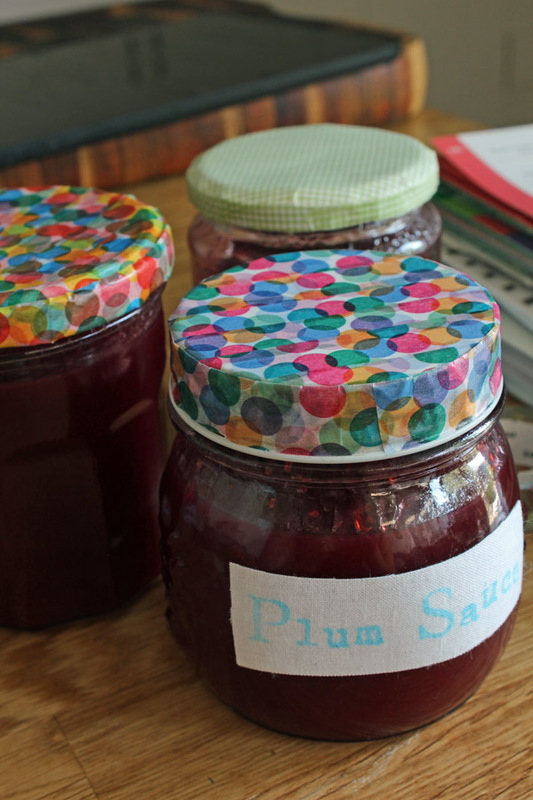 PS: The stuff in these bottles was meant to be plum jam but it never set. 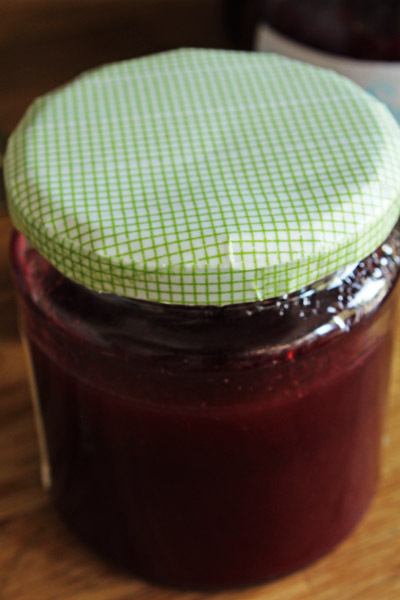 So I called it plum sauce. And it was delish on crepes. I came across this SMYG lamp on my most recent foray to IKEA and I gots me an idea. I do love an IKEA lamp hack. Here’s my last one. I initially bought it with the idea of personalising it for my niece’s birthday but then she’s in the US and this sucker is a bit heavy to post overseas. Not to mention the whole plug conversion pain in the arseyness. It’s a word. You know it is. 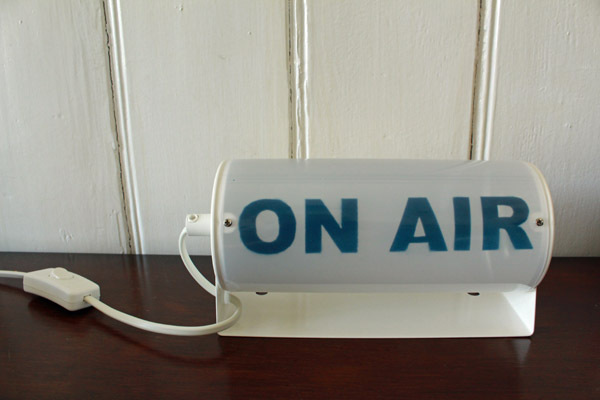 So I had a little ponder about things that light up and as I’ve always loved old-fashioned ON AIR signs thought I’d have a crack at that. 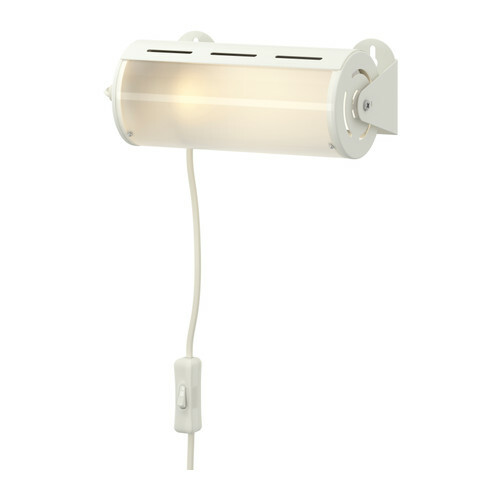 IKEA SMYG lamp. In Australia the product number is: 002.017.77. 1. 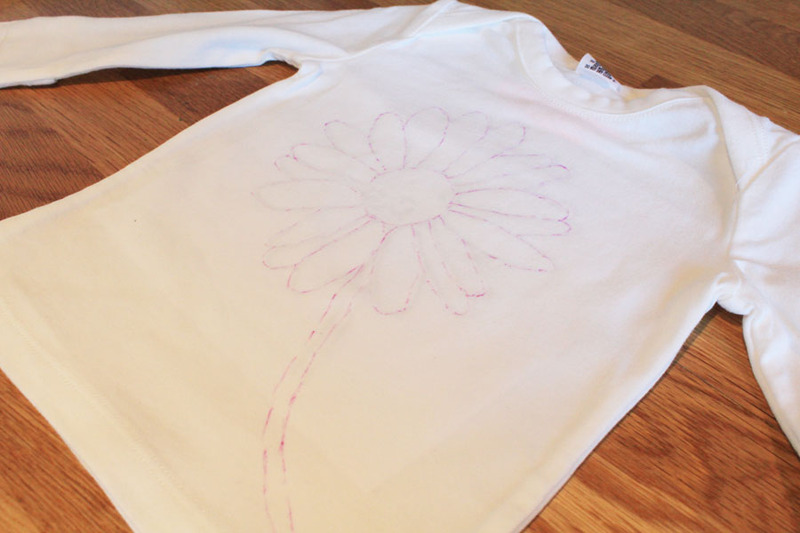 Print your stencil then carefully cut it out using your exacto knife. Go slowly. I give you that advice from bitter experience. I originally wanted to use Helvetica as my font but the capital “R” was not right. So I ended up using Arial Bold printed at 120 points. I like its simple, utilitarian look. TIP: Don’t forget to save your in-between-y bits like the centre of the “O”, “A” and “R”. 2. Unscrew the plastic panel from your lamp. 3. 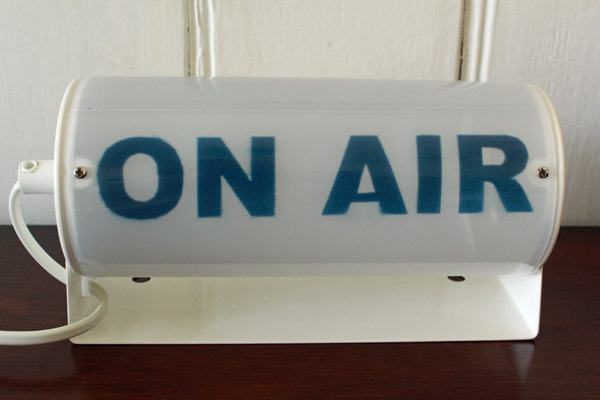 Cut your stencil down to a size that will fit nicely on the panel and then tape it on. 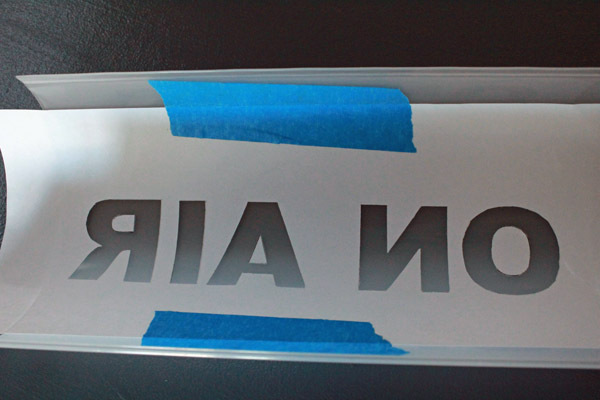 If some bits of the stencil are clearly sitting up a bit from the stencil, you can use little bits of double sided tape here and there to get any recalcitrant sticky-uppy bits sitting really flat. 4. 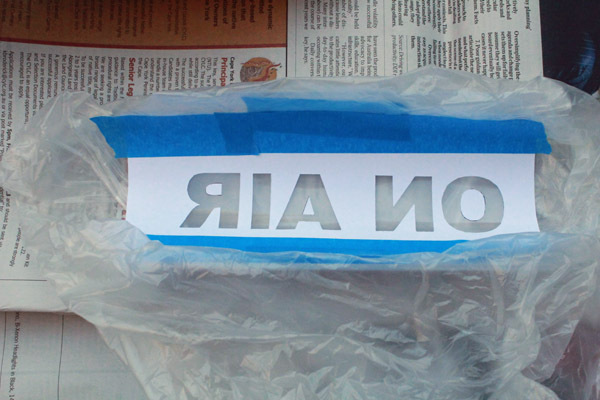 Tape a plastic bag around the rest of the plastic panel so you don’t get any paint on it. 5. Spray your plastic panel. With spray paint. What are you? A wild cat? Because I’m impatient, I gave mine two coats of White Knight Quick Dry Gloss Enamel in Royal Blue. If you’re more patient that I, three or even four coats would give a really solid look. 6. Allow to dry. 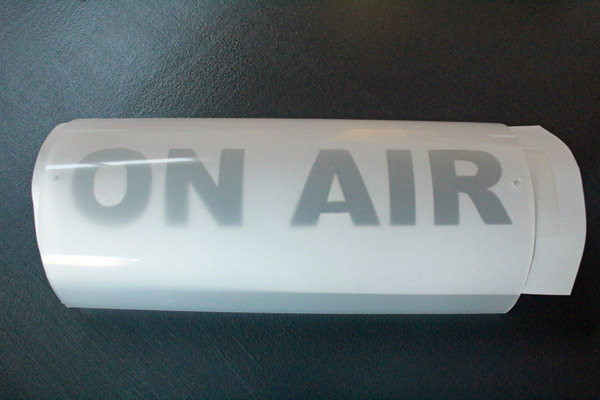 If you have had some leakage out the sides of your stencil, you can use a cotton tip dipped lightly (don’t soak it) in nail polish remover to carefully clean those up. I didn’t have any leakage (on my stencil – just so we’re clear) , but there was some slight fuzziness around a couple of edges that messed with my perfectionist tendencies. I did some really minor cotton tip work. 7. 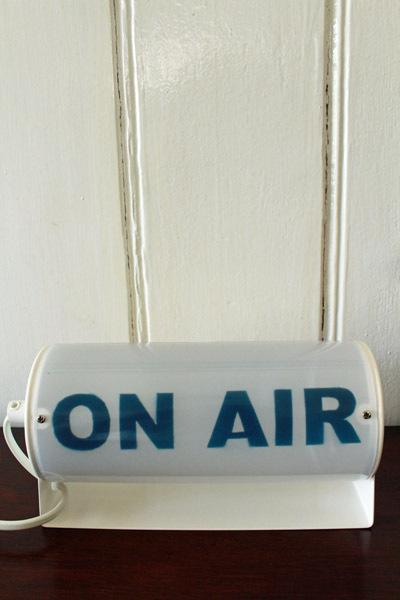 Plug it in, light it up and pretend you’re Daddy Warbucks sending out a message to Annie’s real parents. You can rotate the angle of the lamp. Like so many IKEA products, it’s a clever little piece of design. It’s also designed to be hung on the wall. Which I think I’ll do but haven’t decided quite where yet. 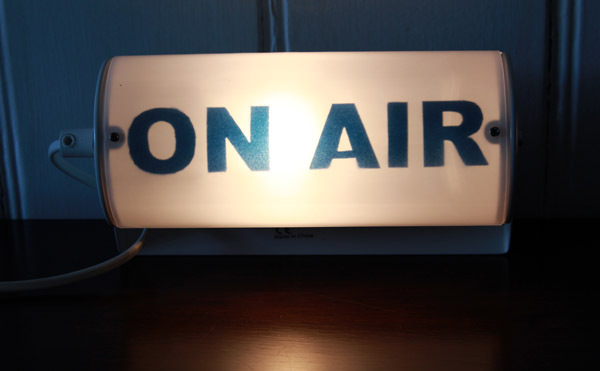 Other ideas: personalise with a name; make one as nightlight for a baby or toddler’s room and stencil “SLEEP” on it. When it’s on, the kid knows what it says and to stay the dickens in bed. We could have used one of those. Either way, I think if you have a go I think you’ll feel pretty smyg about the results. Annoyingly smyg. I love any opportunity to make something to snuggle something else within. And this ipad case is snuggly in extremis. I hit on the idea (and it slapped me for being so presumptuous) the night before our trip to Far North Queensland last year. I’ve been using it ever since and it has held up like a trooper. I also love a pretty trooper. 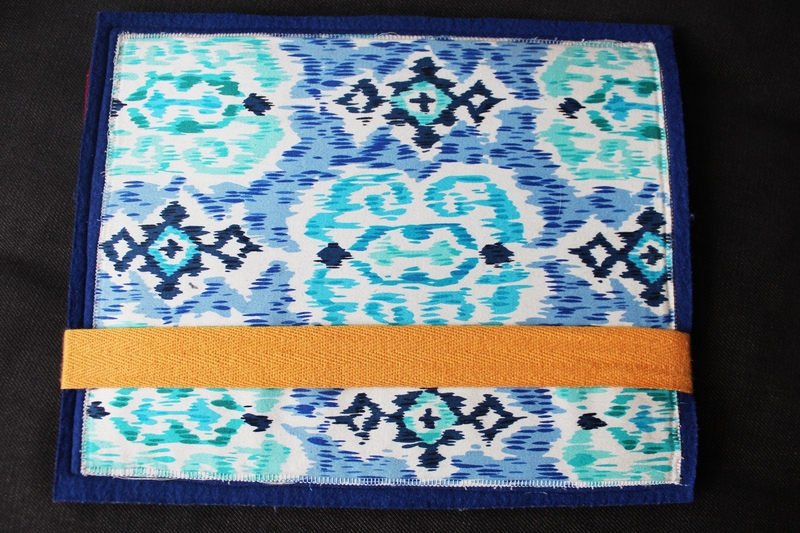 Yet another thing I love is the ikat-inspired fabric. 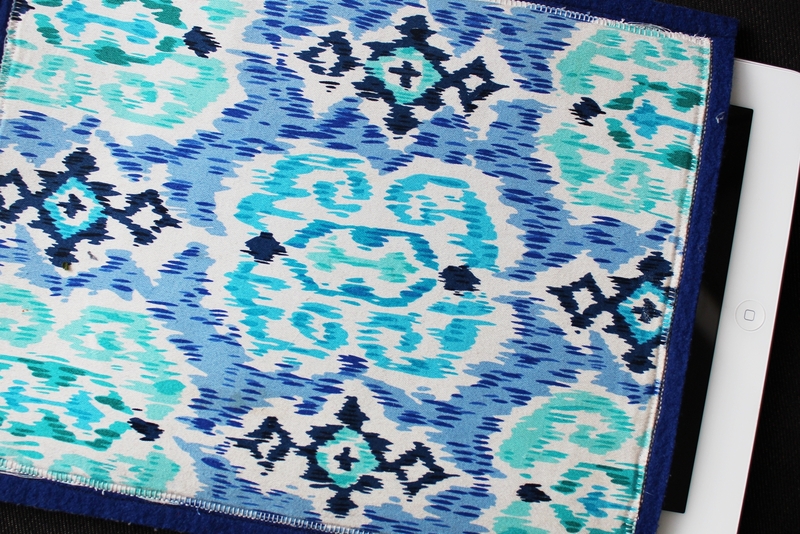 Ikat, as I’m sure you know, is so hot right now. 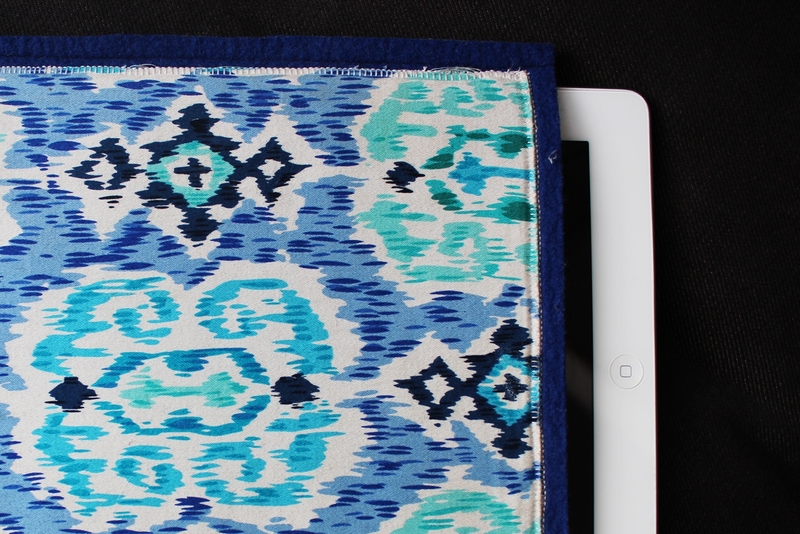 But did you know real ikat has been hot in Indonesia since the dawn o’ time? Did you also know we get the English word “amok” from Indonesian? As in “she saw swathes of authentic ikat in Jakarta and very nearly ran amok”. 1 piece fabric measuring 25cm x 20cm (9 3/4″ x 7 3/4″) (if your fabric frays easily, you may wish to add an extra centimetre or 1/2 inch to the fabric measurements then hem your piece to end up with a rectangle 25cm x 20cm. We are going to stitch along the very edge of the fabric though so if it’s not too bad, just cut straight to size. You could also dab some Fray Stoppa or similar around the edges if you’re concerned. 1 piece sturdy ribbon or twill, 60cm (approx 23 1/2″) in length and at least 2.5cm (1″) in width. Elastic of a similar width to your ribbon. It needn’t be exact. 1. 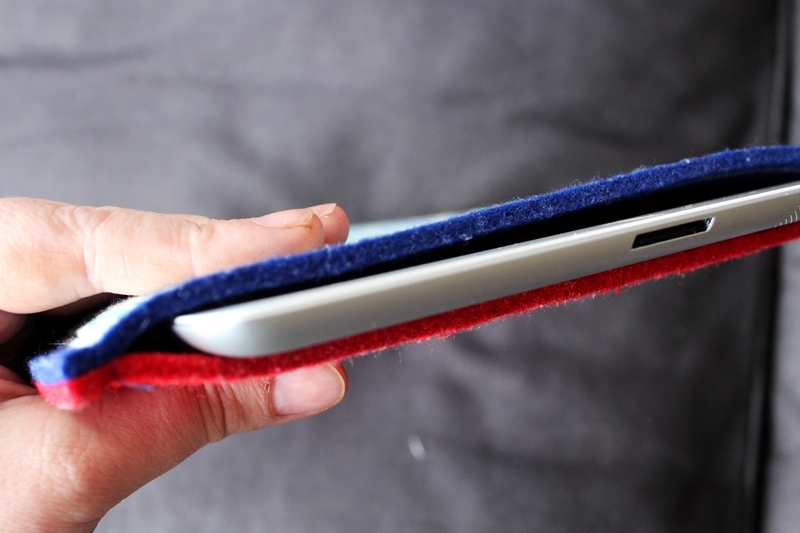 Place your fabric in the middle of the sheet of felt that will be the front of your cover. Just eyeball it. Choose an overlocking-type stitch (or even just a tight zig-zag) on your machine and sew the fabric to the felt. 2. 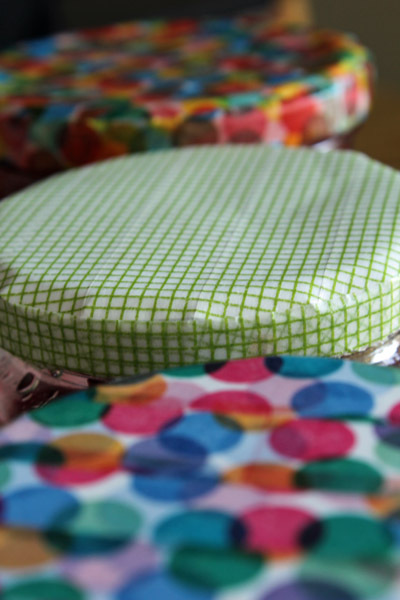 Now, leaving a seam allowance of approximately 1/2cm or 1/4″, sew your front cover to the back. 3. Fold each end of your ribbon or twill in 2cm (3/4 “). 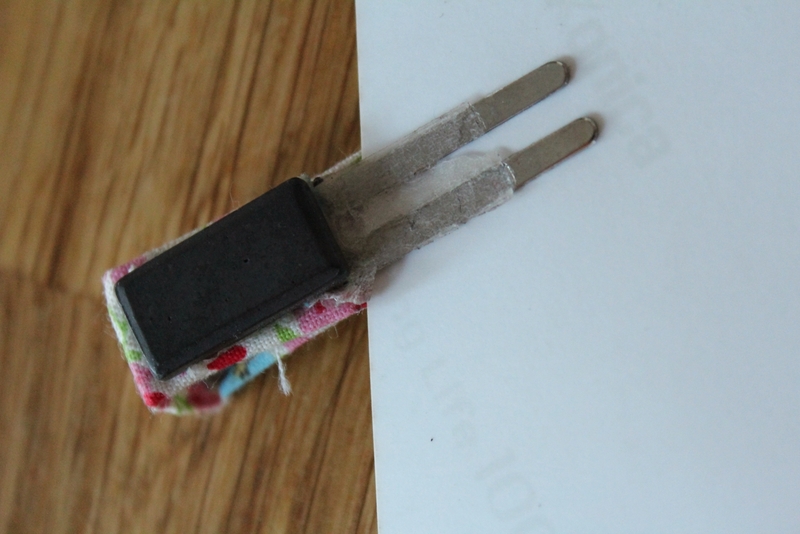 Fold another 2cm (3/4”) so the messy ends are now effectively hidden and stitch around the square end you’ve created to make it really secure. 4. Sew your elastic to each end of the ribbon to create a loop. Make sure the elastic is slack as you sew it. 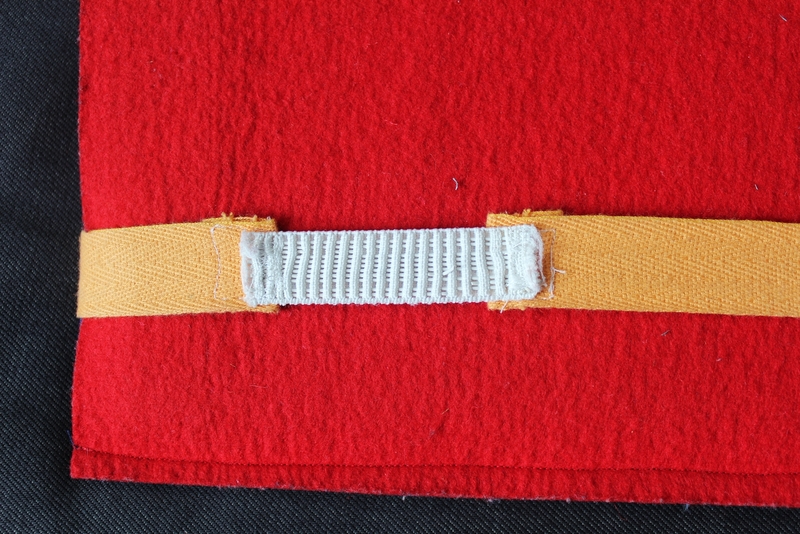 The last up-close photo shows you little bits of pilling on the felt and wear on the elastic. Bear in mind though, I have been using this baby non-stop for over 12 months and I take my ipad pretty much everywhere. Slip your ipad in, slip the ribbon loop over to secure and sigh with contentment. Maybe stroke your pretty little trooper just a bit. Up to you. 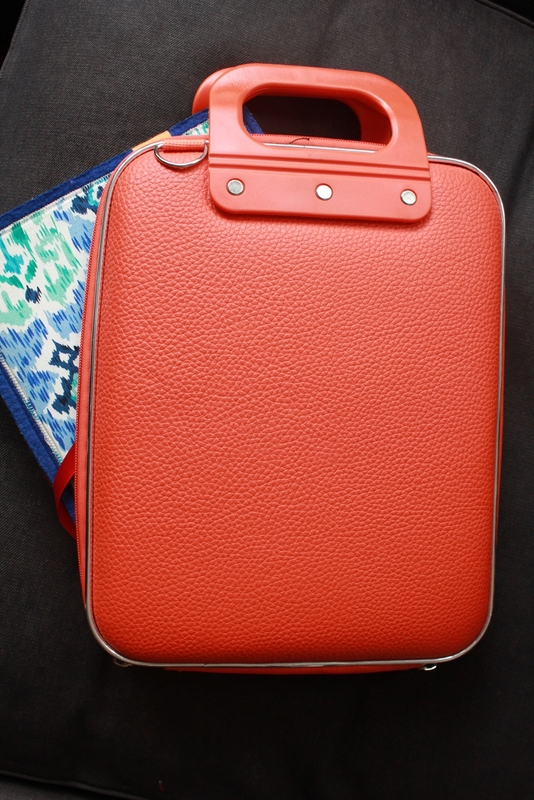 And if I need tougher protection, I snuggle my snuggly case into this very fab protective case. It was designed in Italy, made in China and I bought it in New Zealand. So it was well-travelled before I even met it. I love a well-travelled travel companion. This is the brand. Let me know if you make one my loves. 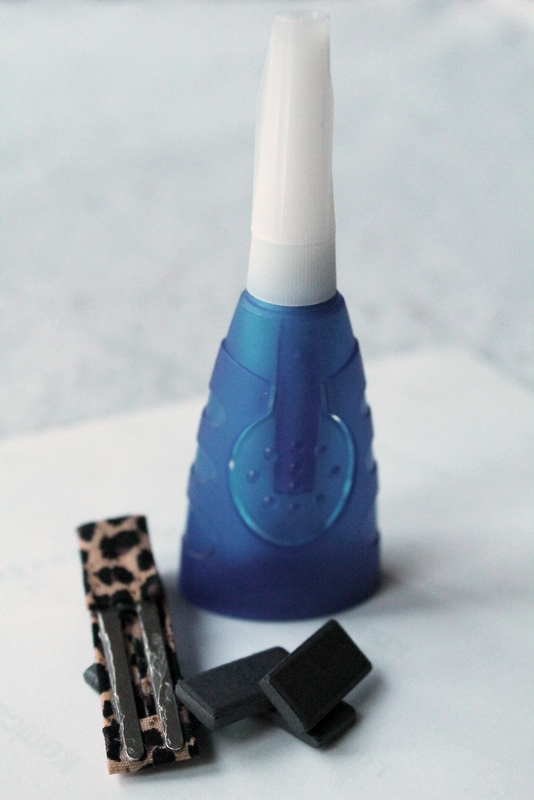 Now that you know how to make my fabric clips, don’t feel constrained to use them just in your hair. They make cute magnets too. It appears I have a thing for making magnets. Oh well, better that than cocaine I suppose. 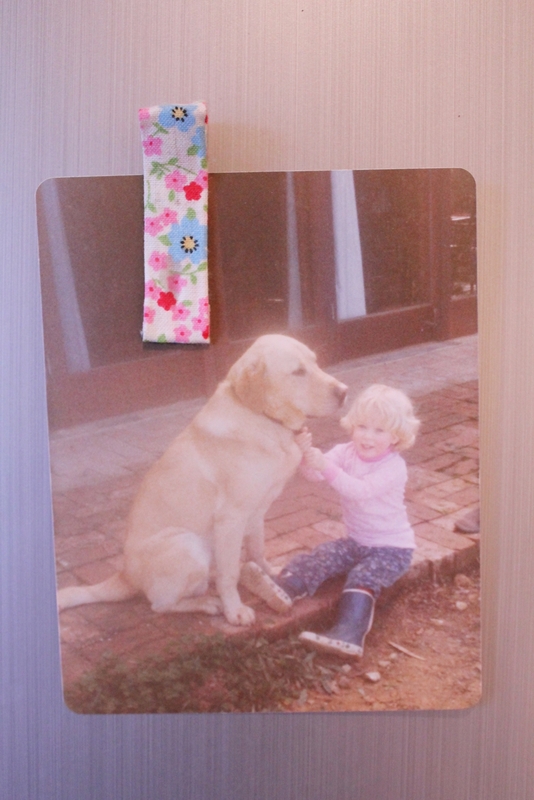 The photo at top is me as a little tacker with one of our succession of beloved labradors. Owners of dogs will be familiar with the “Flat-eared I’m not enjoying this and I will not deign to look at you” face that Alistair is sporting. Perhaps that’s where the expression “hang dog face” comes from? And there’s nothing like some animal print to enliven your fridge front and pep up the display of your wedding photos. 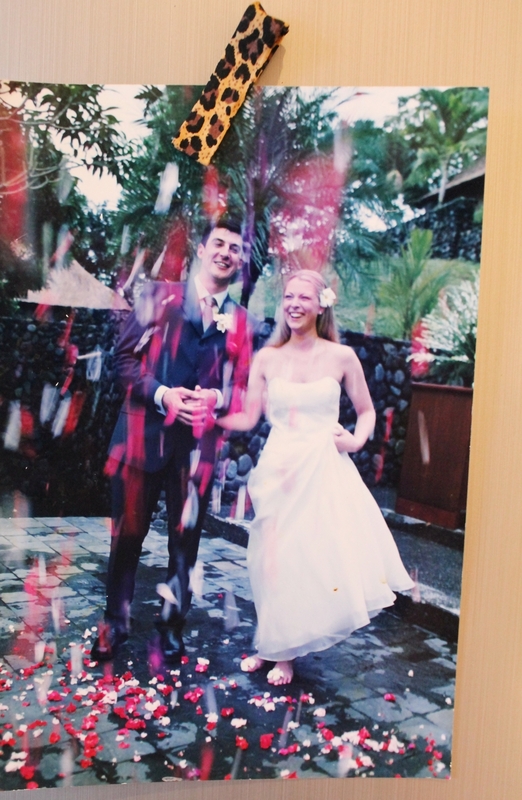 Yep, that’s us almost 12 years ago on our wedding day in Bali. Some of those flower petals went down my cleavage and the lining of that top is still stained pink and red in places. Not that I wear my wedding dress that often any more. Mainly just to pick up the kids from school these days really. Oh, and during the summer solstice of course. Same as everyone really. In truth, these days one would struggle to fit oneself in that dress. Bloody child birthing. Yep, I’m blaming the whole thing on my kids.